More detailed results are available in a PDF format, click here for Full Survey Results. 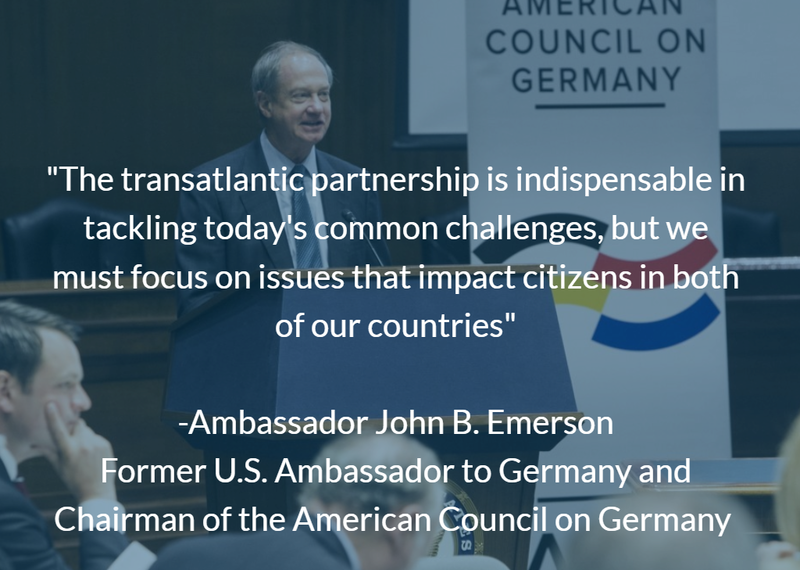 The American Council on Germany and Atlantik-Brücke, both founded in 1952 to strengthen German-American relations, recently commissioned a survey to examine public perceptions of the transatlantic relationship and current challenges for Europe and the United States. The survey was released at their joint conference in Washington, DC, on May 7, 2018. YouGov conducted the surveys simultaneously in Germany and the United States from April 4 to April 15 using two online surveys with respondents (United States: n=2,229 and Germany: n=2,000) recruited from the YouGov panel. The majority of Germans and Americans believe in common Western values. However, about half of the respondents are convinced that the foundation of common values is eroding. One in five Germans does not think that Europe and the U.S. share the same values. 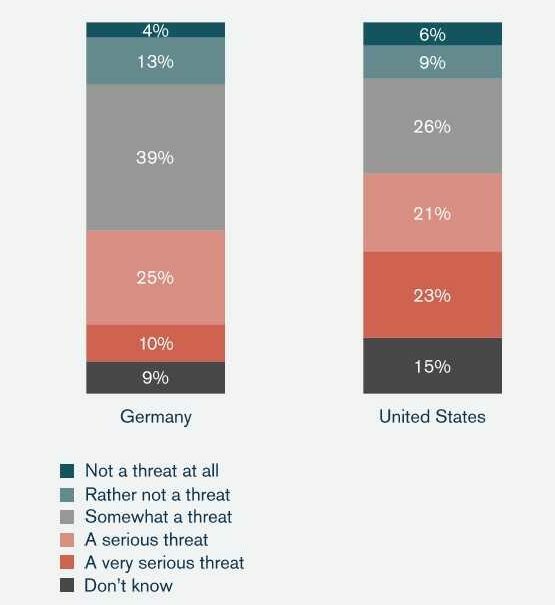 Germans and Americans agree that the key common challenges are the fight against terrorism and climate change. One third of Americans are optimistic that a free trade agreement between Europe and the U.S. will be concluded under the Trump administration. Only 14% of Germans share this view. Both Germans and Americans have a declining trust in democratic institutions. Only one in five is confident in these institutions, while one in three has little or no confidence. Official relations between Washington and Berlin have cooled since the election of President Trump. Chancellor Angela Merkel’s recent visit to President Trump was described in SPIEGEL magazine as “not so bad” – an indication of how low expectations were. But how do Germans and Americans view relations between their countries? Do they feel connected? Do they perceive opportunities and challenges in a similar way? Below are 10 key takeaways from the survey. Detailed results may be found in the links to the report provided at the end of this section. A majority of Germans and Americans believes in a foundation of shared values on both sides of the Atlantic. However, more than half of the respondents are pessimistic about the strength of this foundation. 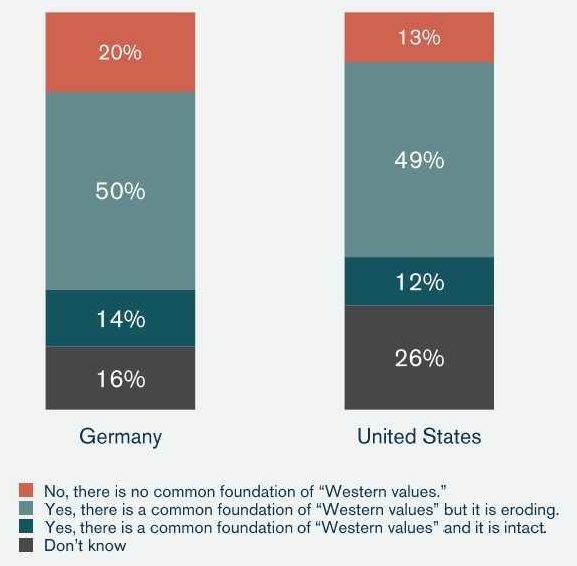 50% of Germans and 49% of Americans believe that the common foundation of shared “Western values” ​​is eroding. One in five Germans and just over one in 10 Americans do not believe there is a common foundation. Only 14% of German respondents and 12% of American respondents believe there is an intact common foundation. 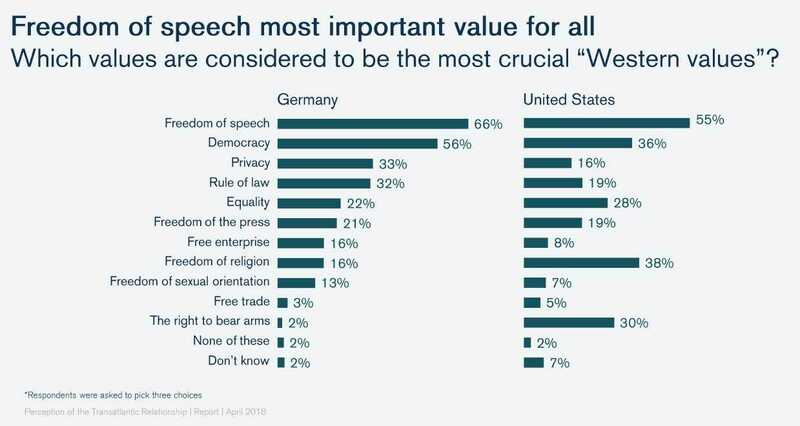 Despite the perceived erosion of a foundation of common “Western values,” there appears to be some consensus about the most important shared value, with freedom of speech ranked highest in both countries. But, Americans and Germans disagreed over the next most important common values. For Germans, the other top shared values were democracy (56%), privacy (33%), and the rule of law (32%), and for Americans freedom of religion (38%), democracy (36%), and the right to bear arms (30%). 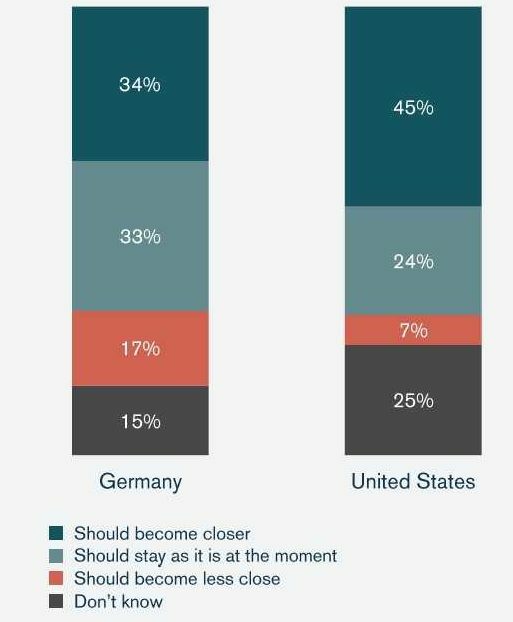 A clear majority of respondents (67% of Germans and 69% of Americans) want transatlantic relations to remain as they are or to become closer. A third of German respondents and nearly half of American respondents believe the relationship should become closer. However, 17% of Germans want the German-American relationship to be less close. Especially German voters for the Left Party (32%) and the Alternative for Germany (AfD) (21%) are against close transatlantic exchange. Both Germans and Americans agree that terrorism and climate change are the most pressing challenges facing the world. One out of five Germans and Americans thinks that terrorism is the most important issue, followed by climate change (19% in Germany and 18% in the U.S.). Additionally, 17% of Germans and 19% of Americans believe that transatlantic cooperation is particularly important in the fight against terrorism. While more than two-thirds of Germans are pessimistic about the prospect of a free trade agreement between the U.S. and Europe under the current administration, more than a third of Americans (36%) believe that such an agreement will come about under the Trump administration. Republican voters are particularly optimistic, at 53%. Nearly 20% of Germans and nearly 30% of Americans said they don’t know whether an agreement is likely. 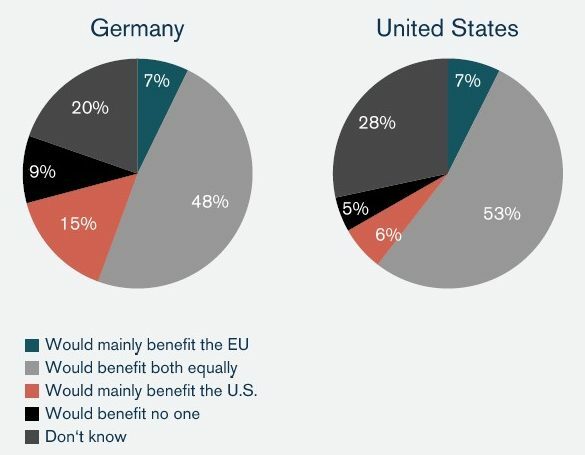 When asked whether a free trade agreement between the U.S. and EU would benefit mainly the U.S., mainly the EU, both, or no one, both Germans and Americans believe that the benefit of a free trade agreement would be reciprocal. It is important to note, however, that 15% of Germans (mainly voters for the Alternative for Germany (AfD) and the Green Party) believe it would mainly benefit the United States. 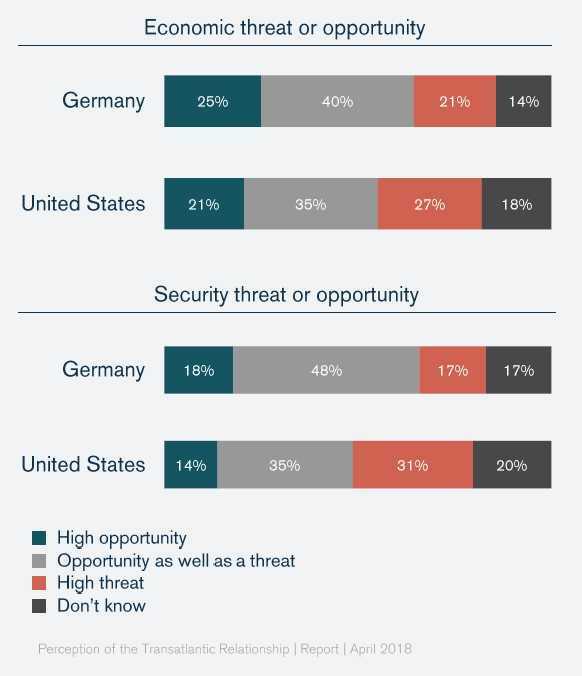 Although very few respondents recognized the rise of China as an urgent global challenge (1% of German respondents and 3% ofAmerican respondents), when asked whether China is an economic or a security threat, Americans appear to be more concerned than Germans. 27% of Americans think China’s economic growth is a clear threat and 31% believe that China poses a major security threat. Germans are more optimistic, with 21% seeing China’s economic growth as a threat and 25% regarding China’s rise as a great opportunity (compared with 21% of Americans). Only 17% of Germans regard China as a major security risk. On both sides of the Atlantic there is a decline in confidence in democratic institutions. 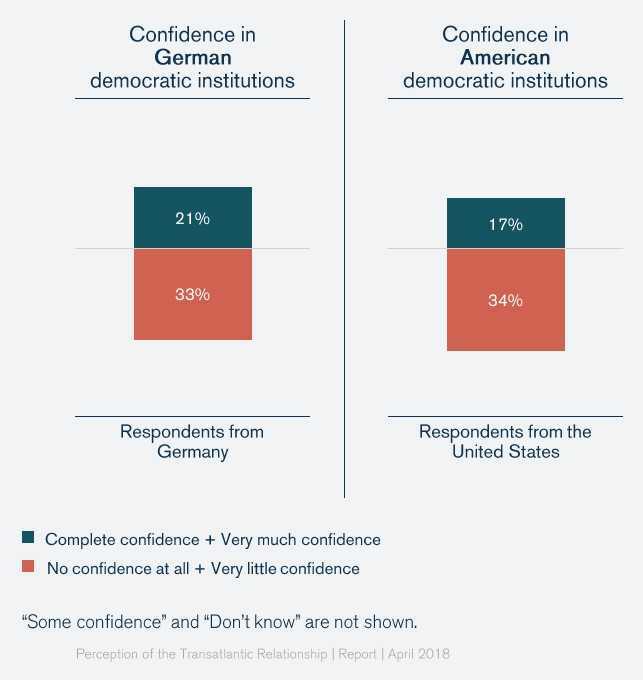 33% of Germans and 34% of Americans have little confidence in democratic institutions. In Germany as well as in the U.S., confidence in democratic institutions decreases with age, but increases with higher educational attainment. Fake news could be contributing to the declining trust in democratic institutions. Americans feel more threatened by fake news than Germans: 44% of Americans think that fake news is a serious threat to democracy. In Germany, this share is 35%. Overall, 74% of Germans think that fake news is a threat, to varying degrees; in the U.S., that number is similar, at 70%. 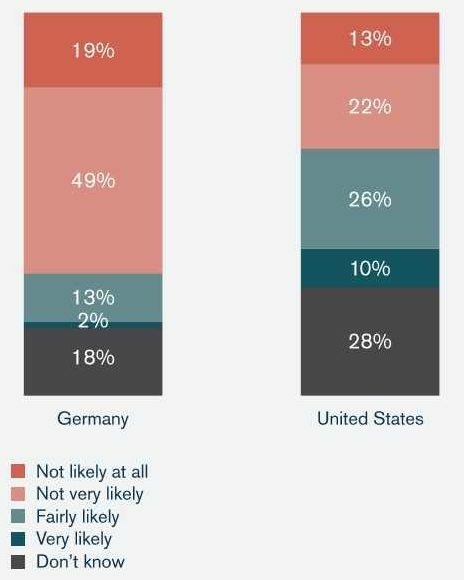 Regarding the impact of digitalization on the labor market, Germans and Americans are equally divided. 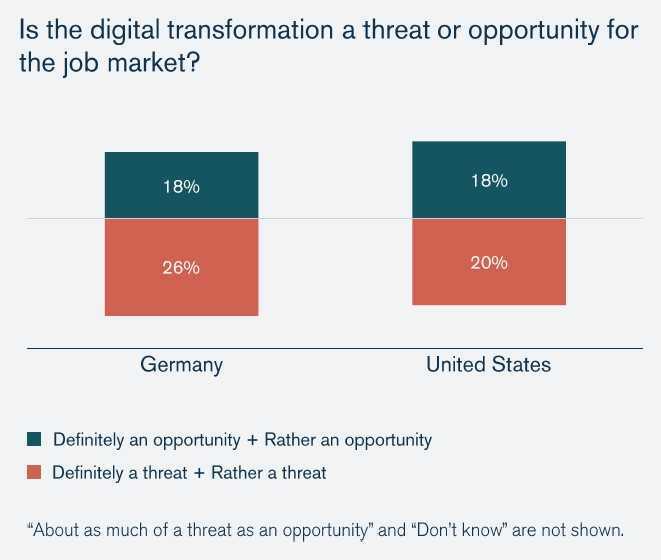 18% of Germans and 18% of Americans see digitalization as an opportunity, while 26% of Germans and 20% of Americans see it as a threat.